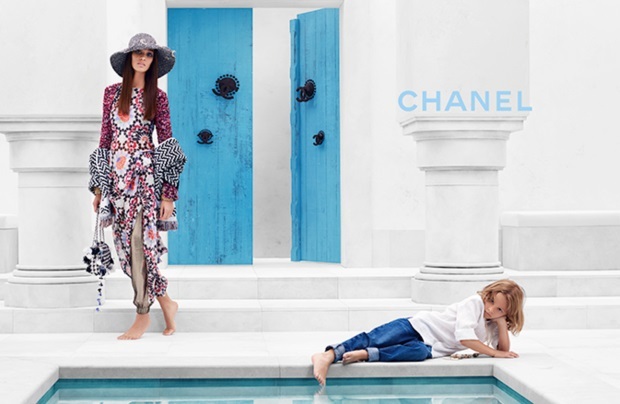 Karl Lagerfeld keeps the theme of his romantic Dubai-presented Chanel Resort 2015 collection going in his new advertising campaign for the iconic French fashion house. Joan Smalls is joined by Hudson Kroenig, the son of Lagerfeld favorite Brad Kroenig. Joan previously appeared in the brand’s Spring 2012 ads with Saskia de Brauw. This time around, Joan dons layered and patterned pieces as she lounges poolside, while a playful Hudson takes center stage. The campaign doesn’t sit well with a few of our forum members. “Haven’t seen Chanel produce a good campaign for a long time. Where is the elegant brand that it used to be?” disapproved HelaFav5. “Boring. Also, is it just me or does Joan look very short in this shot?” asked MyNameIs. “Her expressions are awful. It could have been a decent campaign, but no, some things are off,” wrote an underwhelmed anlabe32. Discussion later shifted to Karl’s latest gimmick. “Hudson looks so random there, completely unnecessary,” proclaimed Marc10. “The kid is the worst prop ever, so unnecessary… it distracts from Joan and the clothes imo,” replied kokobombon. Are you left underwhelmed or overwhelmed? Check out the thread for the full campaign and share your own opinion here.